I define here 'table game' as game with card/board except for computer games. We can play this in the family or with friends. Of course germany is the most game-producing country in the World. Many excellent games are produced constantly every year. Especially they select 'Spiel des Jahres' (Game of the Year) or 'Deutscher Spielpreis'(German Gameaward) annually which we can enjoy ourselves very much. Many japanese gamer pay attention to these awards. There are some games produced in Japan, too. Sho-gi, Go, and Mahjuang are very popular. Game of Life, Uno, Don-jara, and Monopoly also are frequently played. 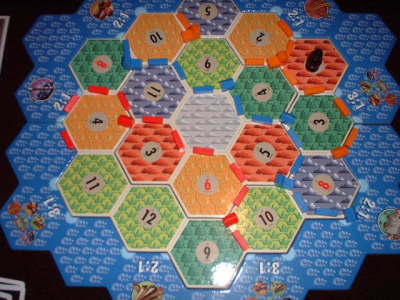 In these days many foreign games are imported, and some of them are re-made as japanese version, such as Catan, Blokus, The Lord of the Rings, Apples to Apples, Ticket to Ride, and so on. Although many excellent games are produced in the world every year, not only few of them are introduced to Japan, but also japanese domestic games are yet developping. I can't believe that japanese don't have capacity to play games willingly, or enough time to play them. It needs only two players and only 15 minutes! Japan is developing country with regard to games. Today we tend to live alone, not to communicate with friends and family, so it is difficult to maintain common senses. Many people become selfish and can't observe social 'rules'. I love table games in the world, of which the rule is quite easy to learn, and which is very interesting to play, by which we can learn to communicate again. I want to inform more people of many interesting games. Top page: News from foreign sites, Links to be checked everyday and search form. You can read some news in Japan in English. Foreign Game Information: New releases or Awards of foreign esp.german games from german sites. Playing Report: Especially about games not introduced in Japan. Rule Translation: Japanese translation by us and Mobius games, co. Designers: Great masters giving rise to prosperity of german games. Review: Variants and unpopular games. Catan: Expansions, variants, and scenarios. Forum: Links, Essay, Voting for best games. Please tell me your affection about table games.